The Hobbit Trilogy Sword Replica Letter Opener Set:Slay letters, not orcs! 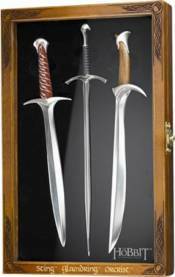 Fantastic and highly-detailed miniature sword replicas fromThe Hobbitmovies. You'll get Glamdring, Sting, and Orcrist! Open your letters with aid fromThe Hobbitfilm series! The Hobbit Trilogy Sword Replica Letter Opener Set is truly a must-have collectible for fans of Peter Jackson'sThe Hobbittrilogy. The set includes not only Bilbo Baggins' Sting sword as a miniature replica letter opener, but you'll also get Gandalf's Glamdring, and Thorin Oakenshield's Orcrist! Normally reserved for slaying orcs, these legendary swords have been scaled down to instead be used for opening your letters. Complete with a stunning wooden display box that measures 10-inches tall x 6-inches wide and features beautiful elven design, this fantastic set of letter openers makes for a great display piece, too! Sting and Orcrist both measure approximately 7 1/2-inches long, while Glamdring measures 8-inches long. Ages 18 and up.